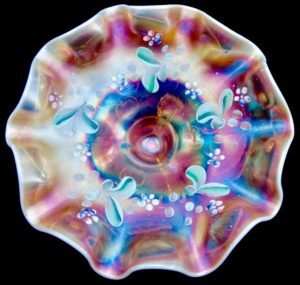 From 1909 through the mid-twenties, the glass-making factory at Indiana, Pennsylvania, made and marketed a number of carnival patterns with cherries interiors. Two—Cherries/Jeweled Heart and Cherries/Daisy and Plume—were produced exclusively during the Dugan years (1909-1913). Another two—Paneled Cherries and Wreathed Cherry—were manufactured by both Dugan and Diamond. The other—Weeping Cherries/Winding Cherry Blossoms—was a Diamond-only creation, perhaps introduced in the early 1920s. The cherries patterns on conventional bowls and plates are contradistinctive yet, for three of them, the differences are subtle. It is unnecessary, however, to know precisely how they differ in order to tell one from the others. Cherries/Jeweled Heart has a round collar base, Paneled Cherries is ball-footed, Cherries/Daisy and Plume is splay-legged, the bowl and collar base of Wreathed Cherry are ovular in shape, and Weeping Cherries is dome-footed. Their back patterns are entirely different. 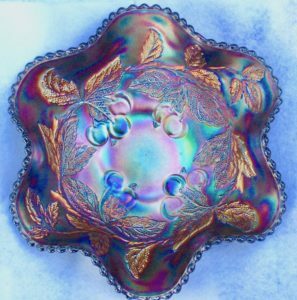 The Wreathed Cherry pattern was made in water and table sets in addition to berry sets (master and sev-eral serving-size bowls). Cherries are also found on other shapes, notably the Many Fruits punch bowl and base, but are but one of the featured fruits. Cherries/Jeweled Heart is an oft seen combination. The interior design is comprised of four clusters of the fruit: two clusters with three cherries, the others with two. It also includes realistic-looking stems and veined and stippled leaves. Two large leaves reach the outer edge, the remainder not that far. On large bowls, the open area in the center is slightly larger than a silver dollar. On the small, the open area is about the size of a 25-cent piece. The ornately cast Jeweled Heart back is also found on the reverse of Dugan’s Farmyard, Petal and Fan. Smooth Rays, and once in a while collar-base Ski Star. Its key features are: (a) highly raised outlines of eight hearts, (b) “jewels” that dangle like glittering pendants from the point at which the ventricles converge and rise like tied down, helium inflated balloons from the tuck at the tip of the heart, and (c) tiny beads which follow the interior contour of the heart and jewels. Its outer edge is serrated. Jeweled Heart is used as the primary pattern on water sets in marigold as well as the striking back pattern. 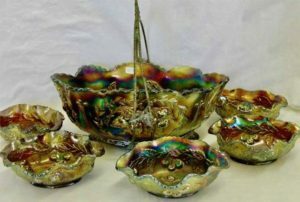 Six- and eight-ruffled large and small bowls are seen more often than other shapes. Large bowls range from eight and one-half to ten inches in diameter, the small from six to just under seven inches. Large bowls are also available in ice cream and proof shapes. The small are found with a tightly-crimped edge as well as the ruffled, ice cream, and proof shapes. 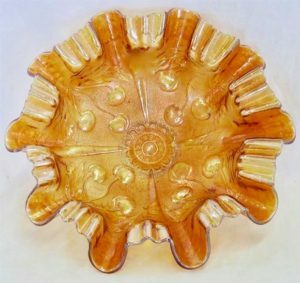 Large bowls have a base diameter of four inches and a 36-point star pressed into the bottom of the base. Small bowls have a two and one-half inch base dia-meter and an unpatterned underside. The large and small ice creams and proofs are seen less frequently. While the distinctions between the ice cream and proof shapes are to some extent fluid, I categorize the difference in small bowls by applying two “rules,” both of which must be met: a “two-incher” for height and a “five-incher” for top dia-meter. To qualify as a proof or “deep sauce,” a small bowl must be at least two inches tall and less than five inches in diameter. A small bowl that is less than two inches tall and five or more inches in diameter is an ICS or something else. Large bowls are comparably classified: the proof is smaller in top diameter and deeper than the ICS. 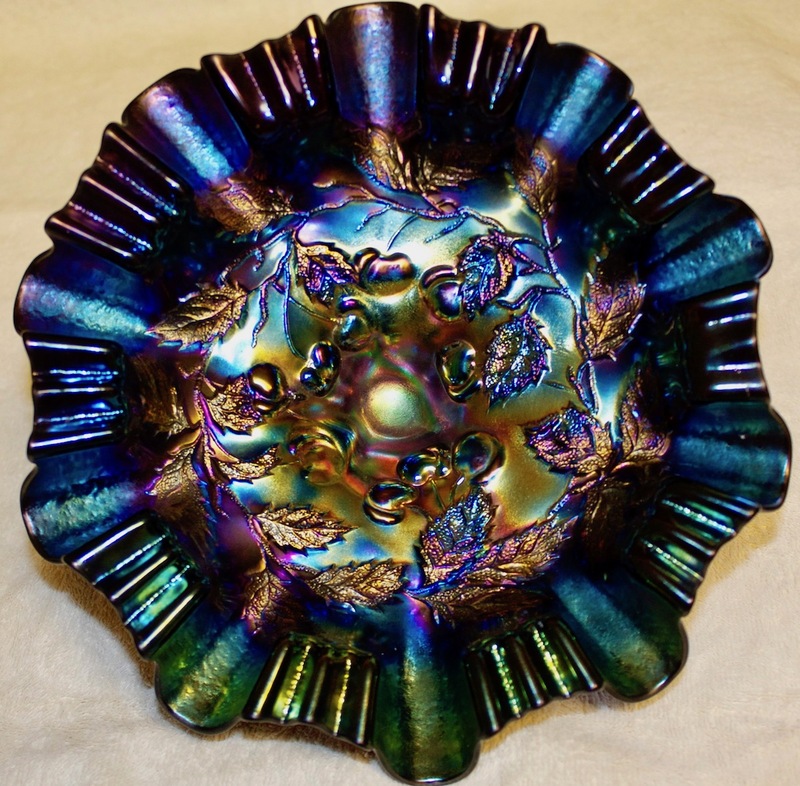 An eight and one-half inch bowl, for example, is likely to be a proof or a deep round; bowls with more expansive top diameters tend to be ruffled or ice cream shape. The tightly-crimped sauces are similar in dimensions to ice cream shape bowls. The plates are also tightly-crimped but shallower than the small bowls. All shapes are available in peach opal, amethyst, and oxblood. Small bowls and plates are also found in marigold, by far the most difficult color to locate. White are said to exist, but I can find no record of any having sold. Illustrated is a stunning oxblood ruffled bowl with multicolor iridescence and electric highlights from Neal Becker’s collection. The inner surface of most Paneled Cherries bowls is similar to Cherries/Jeweled Heart, but it is less expansive. The design is made up of four clusters of fruit—two with three cherries, the others with two—in addition to stems and veined and stippled leaves. Two large leaves extend to within three-fourths of an inch from the outer edge, the rest are placed further inward, their tips as much as one and one-half inches from the edge. A large open area, at least the size of a Susan B. Anthony dollar coin, is found in the cen-ter. The illustrated oxblood with brilliant electric iridescence is Neal Becker’s. Paneled Cherries is named for its back pattern. Seen on each of three panels is a cluster with three life-size cherries and proportionately large leaves. Each panel is demarcated by an elongated frond that looks like a variety of fern. The three rounded ball-footed legs extend from a pronounced distension dead center on the underside. The outer edge is smooth, not serrated. Paneled Cherries bowls are available in a number of colors: marigold, peach opal, amethyst and purple, oxblood, cobalt, and ice blue. Carl O. Burns (Dugan & Diamond Carnival Glass, p. 47) reports knowing of a vaseline with marigold overlay. The marigold and peach opal are abundant in numbers, the amethyst shades also are quite plentiful. The cobalt and ice blue are rare colors. The pattern is seen in several shapes and edge treat-ments, although not all shapes and edgings are available in every color. These include round with six and eight ruffles, flat- (or square-) ten-ruffled, three-and-one, banana-shape with two opposite sides folded in, tri-corner, and heart-shape. The flat-ruffled is sometimes seen with its sides virtually perpendicular to the surface on which the feet rest, creating what has been descried as a nut bowl. Some shapes are found with the outer edge tightly-crimped. A plate in purple is reported as having sold. I suspect it is a relatively flat bowl but that is speculation on my part. The interior of Cherries/Daisy and Plume is the most realistic and intricate of the Dugan and Diamond cherries patterns. Like Cherries/Jeweled Heart and Paneled Cherries, three cherries are found in two of the four clusters, two in the other clusters. A distin-guishing feature of Cherries/Daisy and Plume is a “sandy” (neither stretchy nor stippled) surface tex-ture extending from the outer rim to about an inch and three-fourths inward. A small open area, about the size of a quarter coin, is found in the deeply recessed center. The Daisy and Plume exterior is so stretched from the shaping that the pattern is distorted nearly beyond recognition. Three stylized blossoms, situated above and between the legs, and three fluffy plumes, placed directly above the top of the legs, along with a stip-pled background, make up the design. Three quadrilateral splayed legs—sides and bottom convex in form, top concave—emanate and extend awkwardly outward from a deeply protruding center. The legs are, more often than not, chipped. This damage probably occurred during production, when the bowl was removed from the mold. The chips are normally unobtrusive because the entire outer surface, including legs, is non-iridized. The few bowls of which I am aware are large, mea-suring from eight and three-fourth to nine and one-half inches in top diameter. They range from three and one-half to four inches tall. 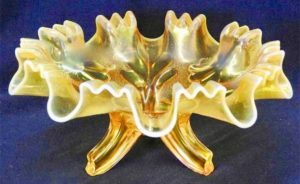 All those I know of have a three-and-one edge, though it is possible ruffled bowls also exist. The illustrated example had been in Marie Capps’s renowned collection until it sold on a Seeck “online-only auction” in June 2016. It is the prettiest of the miniscule number that have surfaced. The only colors I have seen are a translucent fiery amethyst (a reddish purple), like the pictured bowl, and a nearly opaque oxblood. 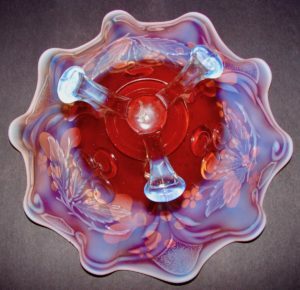 However, I suspect that peach opal exists, as an Absentee Cherries/Daisy and Plume, also three-and-one, sold in August 2016 on a Seeck online auction. Its surface color is weak and washed out, the iridescence negligible, and the opal-escence confined to the very outer edge. Despite these detracting factors, it is a significant find because it indicates the pattern was made in a color primarily associated with Dugan. To the best of my knowledge, the peach opal Absentee Cherries/Daisy and Plume pictured is an “only-known,” although there must be others. It measures about nine inches in top diameter. Curiously, it weighs noticeably less than the bowl with the Cherries interior. The Absentee had belonged to Jerry and Carol Curtis until it sold last summer. Oblong Daisy and Plume ruffled bowls in peach opal sell occasionally. Measuring eight inches long and five and seven-eighth inches wide, and standing five inches tall, they have an unpatterned interior. They should be called Daisy and Plume, rather than Absentee Cherries, because they were almost cer-tainly a Dugan line item. Wreathed Cherry hardly ever gets much attention. For whatever reason, few are very colorful. Interconnected clusters of cherries and veined and stippled leaves (the wreath), along with a single cluster of fruit and leaves directly above and within the confines of the collar base, constitute the interior design. Sometimes referred to as a banana boat, the ovoid master is a foot or more long and nine or so inches wide. The wreath, which covers most of the surface, is made up of eight nearly life-size clusters of fruit, three cherries per cluster, and the connecting leaves. The exterior is made up of four even larger cherry clusters and leaves, each separated by what in a way resembles a stalk of celery. The collar base, like the bowl, is egg-shaped. It measures three and one-half by five inches. The outer edge is gently eight-ruffled and serrated. It stands four and one-half inches tall. The wreathed interior of the ovular serving-size bowl has four cherry clusters and the connecting veined and stippled leaves. Each cluster, wreath, and center alike, has three diminutive cherries. The outer surface has four cherry clusters separated by stalks. Egg-shaped, slightly six-ruffled, and sawtooth-edged, the small bowl measures four and one-half by six inches, the collar base two by three and one-half inches. They stand two and one-half inches tall. 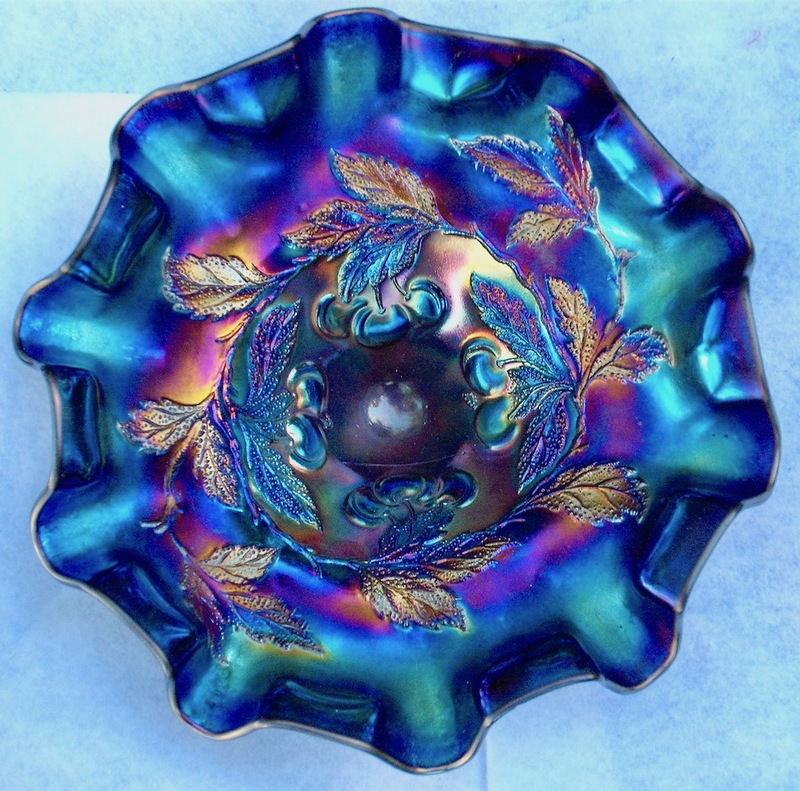 Master and serving-size bowls are available in mari-gold, peach opal, amethyst, oxblood, cobalt blue, and white. Marigold, amethyst, and white are found more frequently than the peach opal, oxblood, and cobalt, the latter seen least often. Of the five patterns discussed, only this one is regularly iridized on the underside. The surface colors and iridescence are more often than not marginal in quality, suggesting that production extended well into the Diamond years. The white often come decorated with painted red or occasionally purple cherries or gold-gilded cherries and leaves. The best of the enameled examples are especially attractive. All colors are available in berry sets (master and multiple serving-size bowls). Sets were packed at the plant or have subsequently been cobbled together. 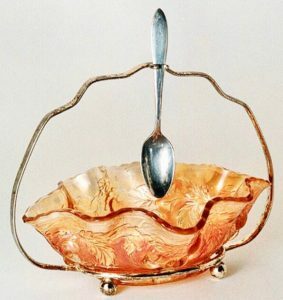 Bowls are also found with detachable metal handle or set in a metal frame, making up what are called brides’ baskets and condiment containers, term dependent on the size of the bowl. Large bowls with unpretentious attached handle or set in fancy frame are baskets. They are available in marigold, purple, and white. Handles and frames for these baskets are identical or similar to those found on some marigold and purple Peach and Pear banana bowls, also ovular in shape. 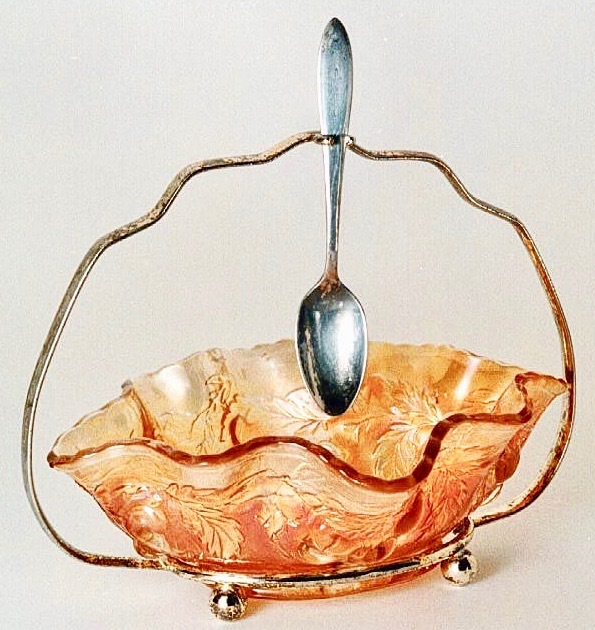 The small bowl in marigold is occasionally seen set in an elaborate frame with insert for a serving spoon. It must have been designed as a jelly or relish dish or a container for another condiment. Other Dugan bowls set in metal frames—like large collar-base Ski Star and Caroline, mid-size Daisy Dear, and small deeply ruffled Fishscale and Beads, ruffled and tightly-crimped banana-shape Petal and Fan/Jeweled Heart, and tightly-crimped banana-shape Smooth Rays/Jeweled Heart—also surface from time to time. Frames for baskets and condiment containers were outsourced by the firm, not in-house produced. Two-piece units like these were marketed in small numbers, probably as novelty or niche items, from roughly late 1910 through 1911. 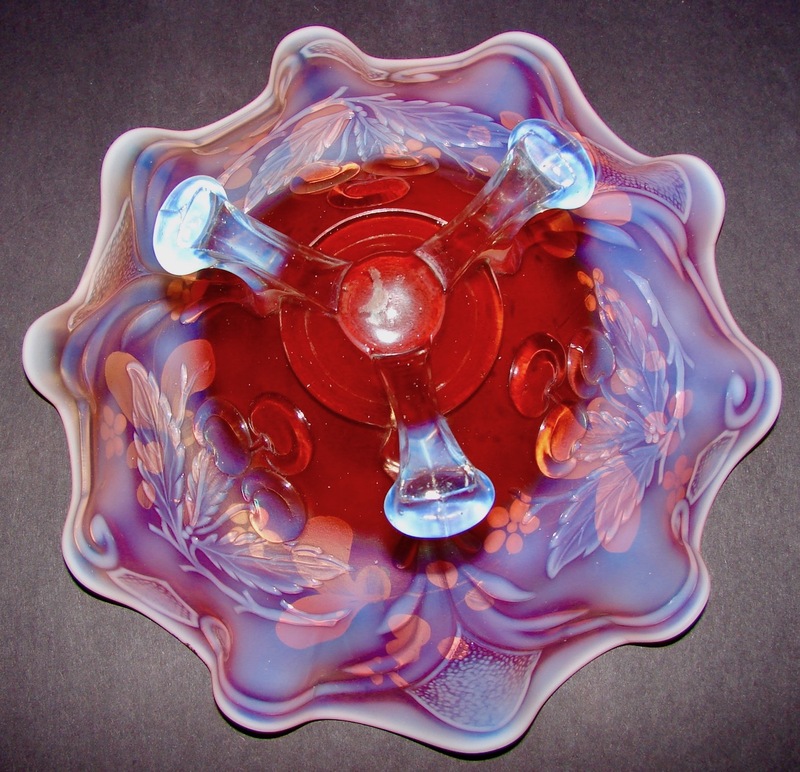 Wreathed Cherry water and table sets are found in a more restricted range of colors than berry bowls. Like the bowls, pitchers and tumblers and table sets (sugar bowl with lid, cream pitcher, spoon holder, and butter dish with cover) were probably made by both Dugan and Diamond. Weeping Cherries is anything but an eye-popping pattern. While interesting in a way, it strikes me as crudely designed. The main elements of the interior are four clusters of fruit and foliage, each with three cherries and two veined (but not stippled) leaves. The clusters are separated by, as Dave Doty has aptly described, “baseball bat-like shapes”. These elements, covering roughly three-fourths of the surface, are set against a grainy stippled background. Encircling the afore-mentioned elements is a half-inch band of concave ribs. In the recess above the pedestal of the domed base is a one and three-fourth inch intricate floral medallion. The top diameter of these bowls measures from eight to eight and one-half inches. They have a smooth, non-serrated outer edge. The Winding Cherry Blossoms on the underbelly is tough to see. That’s because the pattern is minimally embossed and because the surface is radium in finish and non-iridized. It is virtually impossible to photo-graph, and regrettably neither Marion Hartung nor Rose Presznick provided a line drawing. The design is composed of nine small open blossoms, each with 12 petals and a prominent stamen, plus several veined and stippled leaves. The base of the unpatterned domed foot is three and one-half inches in diameter. Weeping Cherries has been reported in a limited number of shapes and edge treatments: apparently only a ten broadly-ruffled and a deep three-and-one. Two colors are known. Marigold is by far the more common. A light, wispy amethyst (or lavender) is also available. Carl O. Burns posits (in Dugan & Diamond Carnival Glass, p. 149) that Weeping Cherries was designed and put into production some years after Thomas and Alfred Dugan left western Pennsylvania. He also notes that bowls are available in cobalt blue, a color I have yet to confirm. 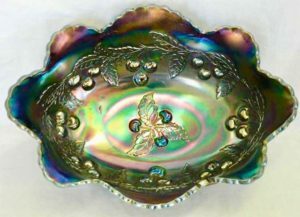 It is possible the cherry designs made in great quantity by Dugan, Diamond, or both firms may be available in pattern variations. I would be interested in knowing what, if any, variants were made. I’d also like to know if I’ve missed colors or shapes in these patterns.